Mashed potatoes are a comfort food in many cultures, and in Peru, it’s the same. But instead of using milk or butter, the Peruvian version of mashed potatoes has lime juice, olive oil and hot peppers. Served cold and topped with a tuna salad, it’s a spicy, light and refreshing dish, perfect as an appetizer on a Summer day. Potatoes, of course, are originally from Peru, and they have been cultivated by the Incas for centuries. 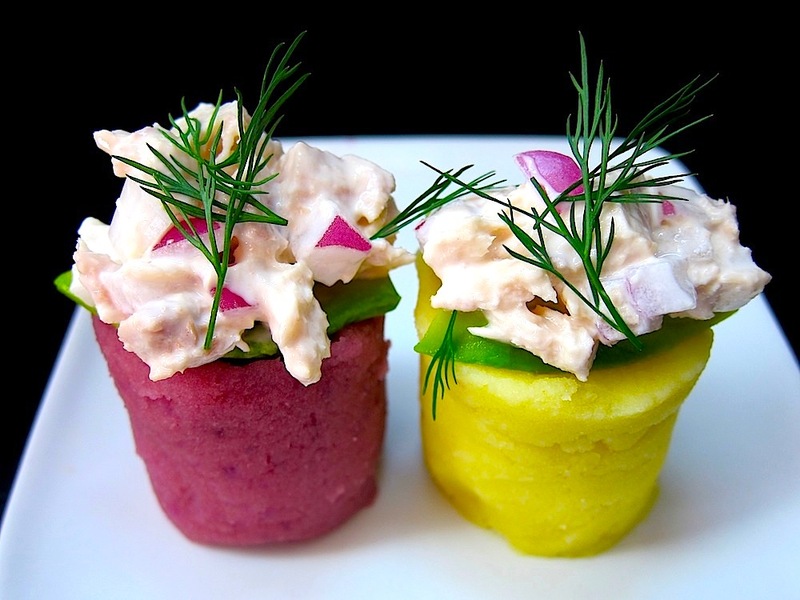 It is believed that the name for this dish, Causa, comes from Kausay, which means sustenance or energy in Quechua. In Lima, during the time of the Viceroyalty, this dish was prepared as a layered casserole, with a filling of tuna salad in the center. The presentation here is a more modern interpretation where the tuna salad is on top of a mashed potato timbale. Many different type of toppings can be used, and I encourage you to experiment with this recipe by making the potato pureé and trying different toppings. Though I usually make this recipe with Yukon gold or yellow potatoes, I like using purple potatoes for added color. In addition to the ingredients above, you’ll need a pot to cook the potatoes, a potato ricer, and bowls to mix the ingredients. Boil the potatoes in a pot with enough water to cover them. Cook until fork tender, 20-30 minutes. Peel and press the potatoes through a ricer and into a bowl. Add 4 tablespoons olive oil, juice of 2 limes, 1 teaspoon salt, and 1/2 teaspoon aji amarillo paste into the bowl, and mix with potatoes to make a purée. The purée should have a creamy consistency that is stiff enough to be shaped. Cover the bowl and chill for 30 minutes. In a separate bowl, mix the tuna, diced onion, and mayo. Add salt to taste if needed. Shape potato purée into timbales and top each serving with a sliver of avocado and a dollop of the tuna mix. Garnish with fresh dill and serve cold. The potato purée mix should yield about 2 cups. As an option, you can use 2 purple potatoes and 2 yellow potatoes. To make the timbales, you can use a fluted cylindrical cookie cutter. I used one that was about 1 1/2″ in diameter and 1 3/4″ tall. Be sure to use tuna that was canned in spring water, not olive oil. Also, if the tuna already has salt, you may not need to add any more when making the tuna mix.